Mudflaps and Skidmark are the nicknames given to Kris(ten) and Col(in) by our friend when we had just left Adelaide on our first big trip to Broome and back. We had some misfortune at White Horse Plain (just outside Adelaide) where our caravan’s wheel fell off! Besides doing a small amount of damage to the van, the mud flap was ripped off and wheel hub left a skid mark on the road. This was the birth of our nicknames. So, this blog will be about our (mis)adventures as we ready ourselves for our first big trip. 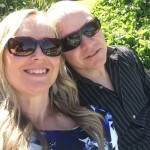 Welcome to our (Kris and Col's) travel blog where we will share our around Australia travel experiences. We've learned a little bit from our friends and the wider travelling community so we hope this site will give something back. In this blog you'll find our (sometimes misguided) plans, our trips and the things we learn along the way. Enjoy! !